Survivors of traumatic brain injuries experience these moments more frequently, even making it hard for some folks to get out of bed. 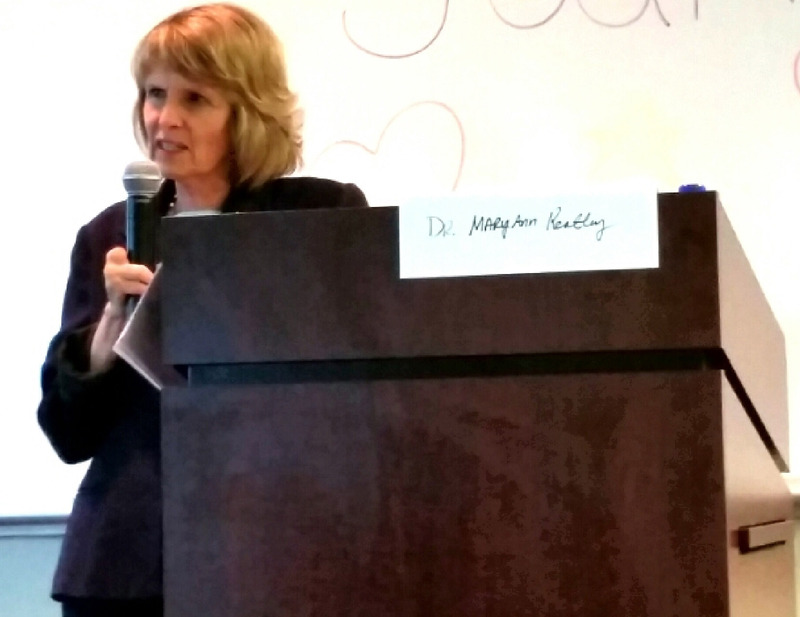 And there are good reasons for this fatigue and ways to overcome the extreme exhaustion as Mary Ann Keatley explained at the fifth session of the 2018 Survivor Series presented by the Brain Injury Hope Foundation through a grant from the Spalding Hospital Volunteer Foundation. The brain uses more energy than any organ in the body. When a brain is injured nearly all of your energy IS REQUIRED to perform basic life functions. Those are two of the main components why TBI survivors experience fatigue, Keatley said at the May 13, 2018, luncheon hosted at Rocky Mountain Human Services in Denver. “It’s a problem with conation,” Keatley said. “Where you don’t have the intellectual energy to finish and process an entire task. Your processing is slowed, so your focus and concentration are off. Physical, which includes tasks such as housework, gardening. Cognitive, which involves paying bills, reading a book, etc. Psychological, which is tied to stress, anxiety, depression and poor sleep. When you wake up tired in the morning this may be an indication of psychological fatigue. And all three play a role in one’s ability to function. 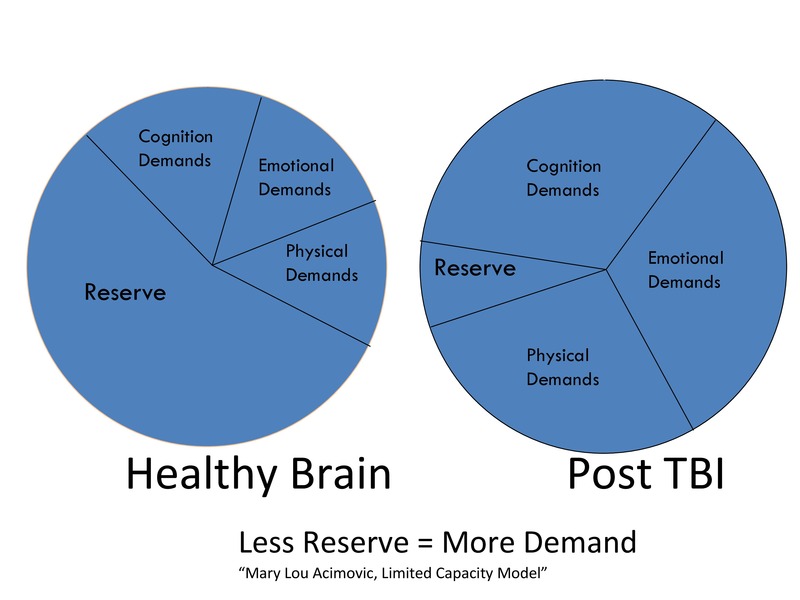 Before a TBI the brain has energy in reserve at the end of the day. After an injury, the survivor has very little left in reserve at the end of the day. This concept is illustrated in The Energy Pie, developed by Mary Lou Acimovic, MA, CCC-Sp. Eat plenty of calories, especially protein — meat, fish, eggs, cheese, nuts – throughout the day. Forget the three square meals a day theory, your brain needs fuel. Don’t run on empty. Rest throughout the day and pace yourself. Even three- to five-minute breaks can conserve energy. Try meditation, breathe, slow down. Wear ear-filters and sunglasses. Sensitivity to noise and light are highlighted after a TBI, so these simple things can decrease the stress so you are not so overwhelmed. Energy allocation. Analyze tasks by how much energy they take AND by how much time they take, rather than just the time it takes to complete a task. An example is going to the grocery store may take more energy because of the visual and auditory stimulation than, say, going to the library. Increase your sleep and take short naps throughout the day. A lack of sleep is one of the most common issues survivors of brain injuries experience. And a lack of sleep leads to fatigue. Keatley gave several treatments to address sleep problems, including supplements, relaxation training (biofeedback), mindfulness/meditation, acupuncture, bright light therapy in the morning, and sleep hygiene (no heavy meals before bed, limit computer and cell phone use). However, one of the most successful was Warm Foot Baths. Yes, something as simple as a 30-minute foot bath one to two hours before you hit the hay is one of the best things you can do to improve your sleep. Keatley pointed to a study in which nurses went to the homes of TBI patients one-year post accident and found that warm/hot foot baths improved sleep better than acupuncture and cognitive therapy. Also fatigue can be related to abnormal protein markers in the brain, abnormal pituitary functions or hormonal deficiencies. Keatley stated that 25 percent to 50 percent of TBI patients have pituitary deficiencies. It’s a stair-step recovery, Keatley explained. You improve, then you level off. You improve, then you level off. And it’s the listening to your body and knowing when you have to back off and take a break that can lead you on a path to regaining and conserving your energy. You have to push yourself to get back to “normalcy,” however, there is a fine line between pushing yourself beyond the limit and taking it little by little. Take small steps to increase your activity. If you take 200 steps a day, increase that to 210, then to 220. Keatley also pointed to recent research by the Kessler Foundation, revealing that cognitive fatigue in TBI is associated with changes in the caudate nucleus and the basal ganglia in the brain. This research may lead to clinical intervention to help alleviate fatigue. It’s ongoing research about the brain that Keatley finds fascinating and promising. In 1999, Kay Jones, MS, LCSW, and Mary Ann Keatley, Ph.D, CCC, Speech-Language Pathologist and Neuro therapist, noticed that many of their patients were unable to obtain funding for basic living expenses, such as food, rent and utilities. Dr. Keatley and Kay Jones co founded The Brain Trust DBA the Brain Injury Hope Foundation (BIHF) with an all Volunteer Staff and Board which has continued to give emergency funding to hundreds of MTBI survivors in Colorado. The mission of the BIHF also continues to educate MTBI survivors, family members and medical and other professionals about the symptoms and treatment options of this “invisible injury.” The Brain Injury Hope Foundation is expanding its Board and educational services. The Survivor’s Series Program has been added to broaden its reach in education and training in the brain injury community.